The RSS has been busy scanning the “multidimensional personality” of B.R. Ambedkar for any hint of Hindutva. Following the heavy defeat suffered in the Delhi assembly elections and in the lead-up to Ambedkar’s 125th anniversary, the efforts have gained new significance. If the reports are to be believed, RSS is going to add Ambedkar to its pantheon of icons. In December, the RSS joint secretary Krishna Gopal had delivered a lecture at the Indian Institute of Public Administration. 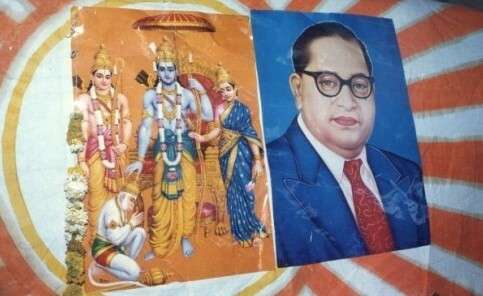 He portrayed the architect of the Constitution as a nationalist, anti-communist, devout Hindu (his immense faith in Hinduism and whose closest friends were Brahmins) and anti-Muslim (he promised “shuddhikaran” or purification for those Dalits who had converted to Islam in Hyderabad state in 1947-48). In today’s Hyderabad, as Asaduddin Owaisi’s MIM attempts to go national by rallying the support of Dalits to counter Hindutva, the RSS too is eyeing them to shore up its chances of winning the assembly elections in Bihar and Uttar Pradesh. Its leaders, including Krishna Gopal, know that the best way to steal Dalit hearts is to co-opt their icon. At the IIPA, the organisers of Gopal’s lecture had also circulated his pamphlet Rashtra Purush Babasaheb Dr Bhim Rao Ambedkar in which he talks about Ambedkar’s “deep friendship” with RSS founder K. B. Hedgewar. “He was a patriot and remained a Hindu from his birth to death in his worldview and philosophy,” Gopal said. According to the The Pioneer, “The RSS would hard-sell the idea of integration of Dalits and their economic and social advancement in Hindu society from 14 April onwards during the celebration of 125th anniversary of Dr Bhim Rao Ambedkar.” The newspaper also said that the RSS-affiliated publications – Panchjanya and Organiser – would bring out special editions on Ambedkar. Health, education and socially deprived sections are on the agenda of a function to be organized by the RSS outfit Sewa Bharti in Delhi from 4 to 6 April, in which Wipro chairman Azim Premji, among others, is set to speak to an audience of around 4,000 participants that will include Amritanandamayi Devi, Jagadguru Shankracharya, filmmaker Subash Ghai and several academicians. In the preface to his pamphlet, Krishna Gopal, whose tenure as the joint secretary responsible for liaising between the RSS and the BJP has been extended at the recently held annual meeting in Nagpur, has described how thousands of Sewa Bharti workers are visiting Dalit hamlets with the message of social harmony.